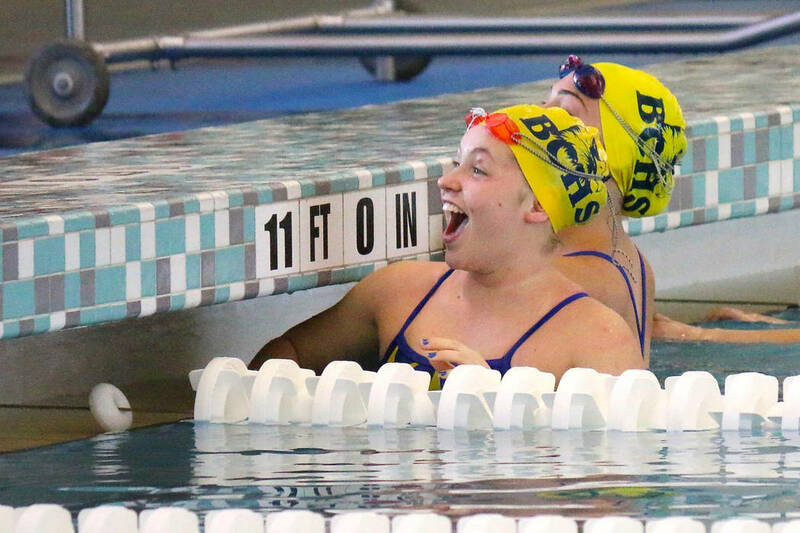 Dominating the 3A Southern Nevada swim landscape, nearly the entire roster for Boulder City High School’s girls and boys swim programs made either the 3A All-Sunrise League first or second teams. Laura Hubel/Boulder City Review Boulder City High School junior Aimee Garcia, seen at a meet earlier this season, was one of 12 Lady Eagles named to the All-Sunrise League first team. Claiming the 3A state championship this season for the sixth consecutive season, the Lady Eagles featured 12 first-team members after going undefeated this season. Defeating Northern challenger Truckee 170-150 in the state final, senior Gwynn Miller, juniors Aimee Garcia, Rose Pouch, Annika Freiburger, Ashleigh Wood and Lily Gibson, sophomores Quinci Thomas, Audrey Selinger, Tegan Pappas and Megan Johnson and freshman Daphne Thompson and Katie Gray were all first-team selections. Pouch, who was named the girls swimmer of the year during the Las Vegas Review-Journal’s Best of Nevada Preps awards June 3, set a pair of state meet record times in the 100-yard butterfly (55.63) and 200-yard individual medley (2:03). Garcia also won a pair of events at state: the 200-yard freestyle in 1:54.68 and the 500-yard freestyle with a time of 5:03.77. Freiburger finished second at state in the 100-yard breaststroke with a time of 1:08.85. Making the second team for the Lady Eagles were senior Jillian Porter, junior Samantha Wagner and freshmen Abbi Matthews and Jessie Fernandez. For the boys, senior seniors Clayton Pendleton, Andre Pappas and Robbie Leavitt, juniors A.J. Pouch and Chandler Larson, sophomore Alejandro Garcia and freshmen Joseph Purdy, Ethan Porter, Seth Woodbury and Bret Stewart were first-team selections. Finishing as the boys swimmer of the year runner-up, A.J. Pouch set a pair of state meet records, placing first in the 100-yard breaststroke (55.35 seconds) and 200-yard individual medley (1:50.46). Earning second-place finishes for the Eagles at state were Larson (100-yard backstroke; 57.66 seconds) and freshman Purdy (500-yard freestyle; 4:49.27). Earning second-team league honors were senior Jacob Jones, juniors Ty Pendleton and Jonas Hanson and freshman Charlie Larson.